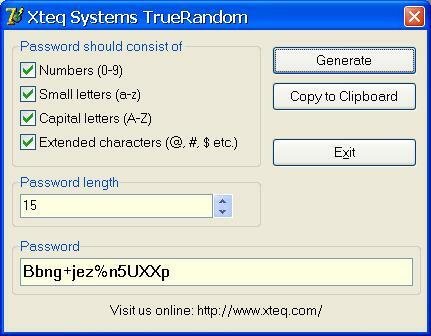 Xteq TrueRandom is a small program that generates truly random and therefore very secure password, pass phrases or network keys (e.g. for WPA/WEP). You can choose which parts your password should consist of (number, small, capital letters and special characters) and also the length of it. Xteq TrueRandom then generates a truly random password for you. With a single button click you can copy the generated password to your clipboard. Xteq TrueRandom is great to generate any form of passwords/pass phrases when you want to make sure the password should be unpredictable. The Windows Crypt API has a very good random number generator build in that Xteq TrueRandom uses.